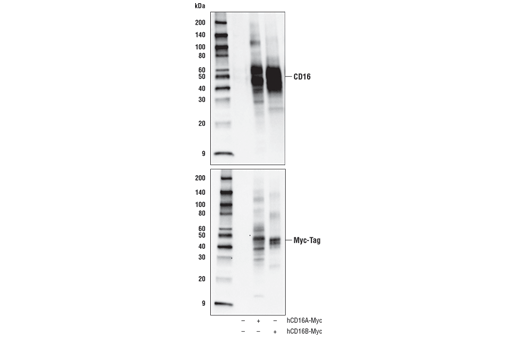 Western blot analysis of extracts from 293T cells, untransfected (-) or transfected (+) with construct expressing human Myc-tagged CD16A or human Myc-tagged CD16B, using CD16 (D5Q8N) Rabbit mAb (upper) or Myc-Tag (71D10) Rabbit mAb #2278 (lower). Western blot analysis of extracts from Human NK cells, Raji cells, and HeLa cells using CD16 (D5Q8N) Rabbit mAb (upper) and β-Actin (D6A8) Rabbit mAb #8457 (lower). CD16 (D5Q8N) Rabbit mAb recognizes endogenous levels of total CD16 protein. 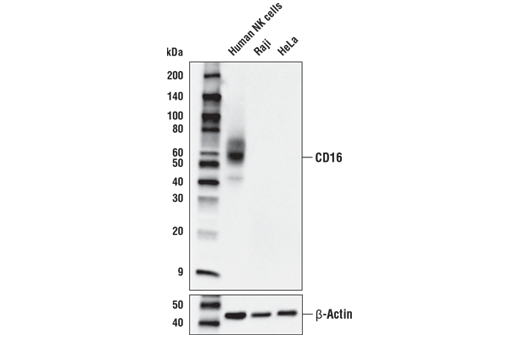 This antibody detects CD16A and CD16B. Monoclonal antibody is produced by immunizing animals with a synthetic peptide corresponding to residues surrounding Pro32 of human CD16 protein. CD64 (FcgammaRI), CD32 (FcgammaRII) and CD16 (FcgammaRIII) are three classes of the immunoglobulin superfamily. CD64 has a high affinity for IgG with three Ig-like domains while CD32 and CD16 have low affinities with two Ig-like domains. Two genes encode CD16-A and CD16-B resulting only in a 6 amino acid difference in their ectodomains. However, CD16-A has a transmembrane anchor versus CD16-B, which has a glycosylphosphatidylinositol (1). CD64, CD32 and CD16 are membrane glycoproteins that are expressed by all immunologically active cells and trigger various immune functions (activate B cells, phagocytosis, antibody-dependent cellular cytotoxicity, immune complex clearance and enhancement of antigen presentation) (2). CD16 cross-linking induces tyrosine phosphorylation (Tyr394) of Lck in NK cells (3). CD32 has tyrosine-based activation motifs in the cytoplasmic domain in contrast to CD16, which associates with molecules possessing these motifs (1). CD16A is expressed by NK cells, macrophages, and a subset of monocytes, while CD16B is expressed by neutrophils (4). CD16 is commonly used in combination with CD56 to characterize NK cells, with CD16 identifying NK cells capable of cytotoxicity (5). Maenaka, K. et al. (2001) J. Biol. Chem. 276, 44898-44904. Fridman, W. H. et al. (1992) Immunol. Rev. 125, 49-76. Pignata, C. et al. (1993) J. Immunol. 151, 6794-6800. Pincetic, A. et al. (2014) Nat Immunol 15, 707-16. Nagler, A. et al. (1989) J Immunol 143, 3183-91.